Yuri Bushnev is a Head of System Quality at AlphaSense, with more than 5 years of experience in Quality Assurance, DevOps and Development. 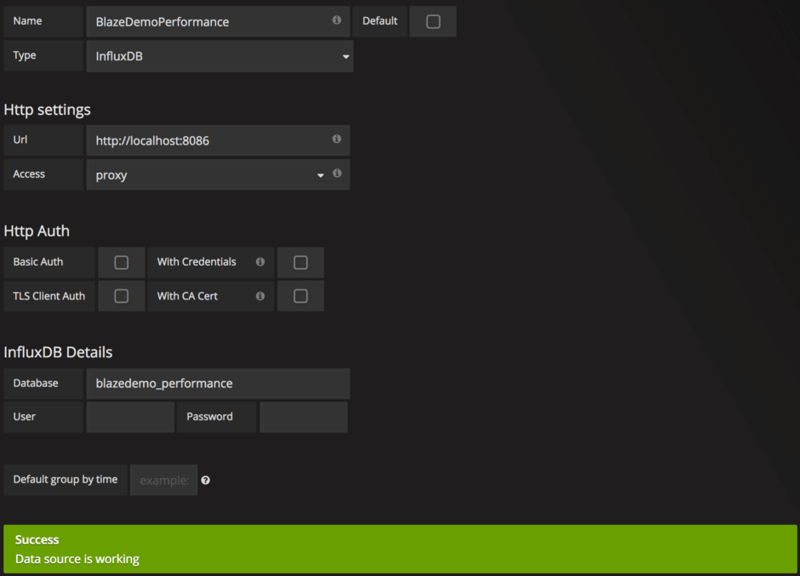 In our latest article about JMeter Non-GUI Monitoring, we explained how to integrate Apache JMeter™ with Grafana to establish real-time monitoring of performance scripts. This can be done by using a local installation of the InfluxDB database as a metrics storage, together with a Backend Listener and the “GraphiteBackendListenerClient” implementation. This Grafana integration via “GraphiteBackendListenerClient” requires developers to proceed with a list of non-trivial steps, to get it done. But our followers noticed (special thanks to Vincent D.) that there is one more easy way to perform an additional JMeter Grafana integration, which is simplified and doesn’t require any additional configuration of the InfluxDB. We always appreciate feedback, so in this blog post we will explain a simpler way that uses the same JMeter Backend Listener, but with the “InfluxDbBackendListenerClient” implementation which takes less setup efforts. This implementation uses API for pushing metrics. With the release of JMeter 3.2 by the Apache team, a new Backend Listener interface was introduced. This listener enables using InfluxDB HTTP API and pushing metrics directly to the database via Asynchronous HTTP calls, without any additional database configurations. 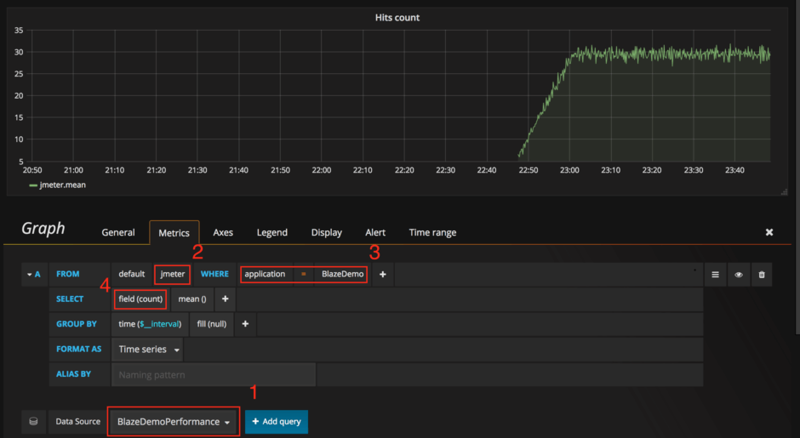 If you took a hands-on approach to our latest article about Grafana monitoring, you probably already have Grafana and InfluxDB installed on your local machine. If not, use the InfluxDB and Grafana installation guides to install both locally. The same goes for our performance script monitoring which will be exactly the same as we created in the last article. But actually, you can use any performance script that you already have ready in your arsenal. In the last article, we showed an example of how to use the InfluxDB command line interface to make database queries. Another way to interact with the database is with InfluxDB’s HTTP API, which allows you to query and write data metrics from/to the database. As you can see, it is quite simple. 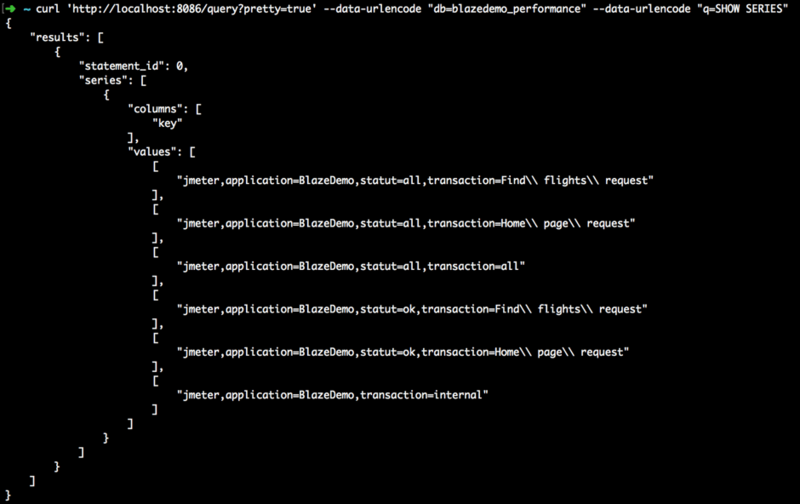 That’s why the Apache team thought - why not use the same HTTP API to push metrics from JMeter to InfluxDB? With the launch of JMeter 3.2, they introduced a new implementation of Backend Listener, which is called “InfluxdbBackendListenerClient”. It was added to JMeter 3.2 in Alpha state (an early version that might be unstable). But turns out is quite stable and is already used across the JMeter community without any critical issues. Once the configuration is in place, let’s run our JMeter performance script. You can run it via the JMeter UI or you can run it in the Non-GUI mode (check this article if you want to know how). As soon as we start our performance script, the Backend Listener starts to push metrics which will be collected in InfluxDB database with the name “blazedemo_performance” as we configured before. During dashboard creation, you first need to choose the correct ‘Data Source’, based on the one that you have just added. On the second and third steps you need to specify measurement and application names, based on values that we have specified into the JMeter Backend Listener. On the last step you need to choose metrics that will be shown on the graph. It’s very simple, as it should be! As you can see, the “InfluxdbBackendListener” is much simpler and requires less configuration to start using Grafana for JMeter tests monitoring. In comparison with the “GraphiteBackendListener” which we introduced in the last article, this way is much much simpler. But is it simple enough, or are there even more simple ways? You will be surprised, but YES! 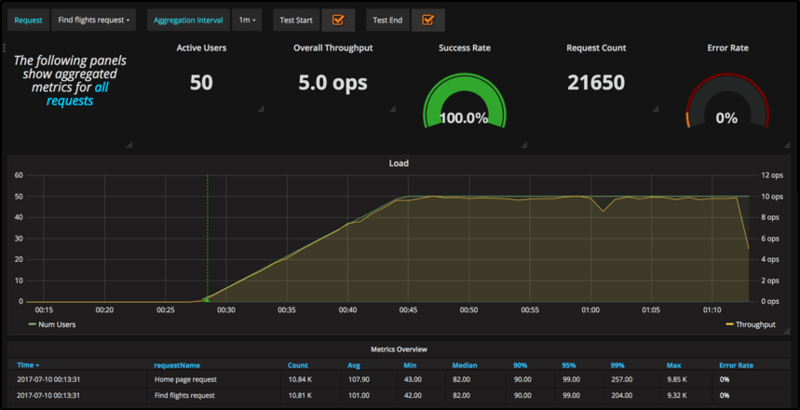 Developers from NovaTec-APM decided to make our life much easier, and created their own ready-to-use JMeter Grafana dashboard with all the key monitoring graphs and dashboard elements. You can find all the relevant information through this link. Using that predefined dashboard you don’t need to spend time on dashboards creation, as everything is already created for you to monitor detailed stats right away in just a few easy steps. If your JMeter application is open, you need to restart to proceed with the installation of the additional plugin. 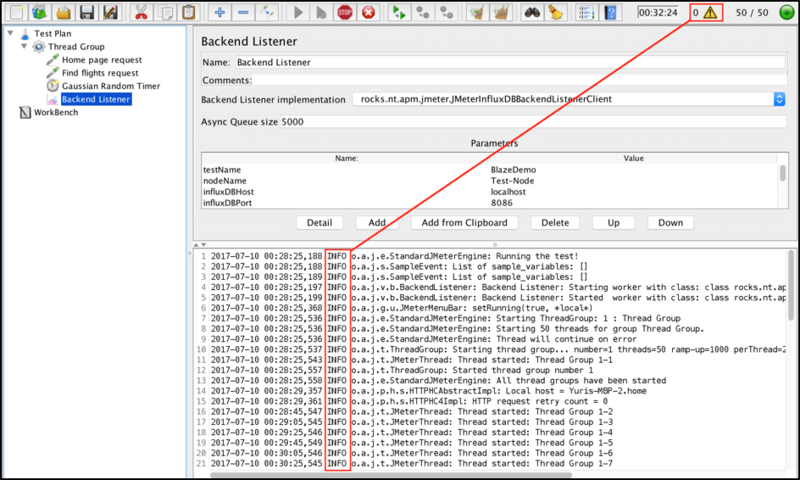 After that, you can open the previously created “Backend Listener” and this time there will be additional option available in the “Backend Listener Implementation” field: “rocks.nt.apm.jmeter.JMeterInfluxDBBackendListenerClient”. The configuration of this listener client is pretty similar to implementations that we have been used before, and the configuration options are almost the same. In our case all we need to do is to provide the “testName” and “influxDBDatabase” names, respectively. As you can see, there are always many ways to achieve your goals. Based on all 3 ways of JMeter and Grafana integration which we have tried in this and the previous article I would definitely recommend to go with the last “JMeterInfluxDBBackendListenerClient” integration. Yes, it requires you to install an additional plugin, but it is nothing in comparison to the benefits that this plugin provides you in the end. 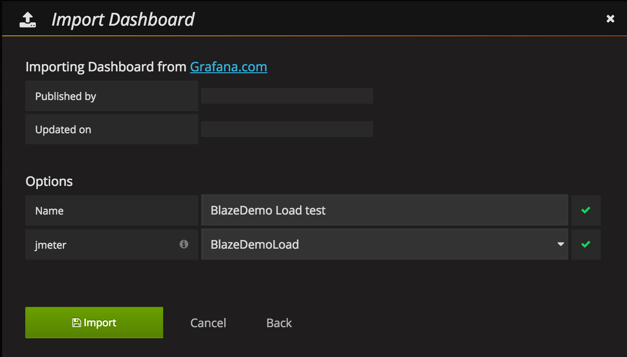 Thanks to feedback of our followers, we have now covered all relevant ways of JMeter integration with Grafana. Let us know which way you prefer and why in the comments section. To try out BlazeMeter, which enhances JMeter and also provides real-time, collaborative and in-depth analysis, put your URL or JMX file in the box below. Your test will start in minutes.